All meals, local wine and spirits, beer and soft drinks. Exhilarating camp-to-camp walking along the beautiful game-rich floodplains of the Zambezi River. A really satisfying active safari in a stunning location. I loved walking from camp to camp and we encountered some impressive wildlife including the painted wolf pack filmed for David Attenborough's Dynasties series. Despite a turbulent political past and economic challenges in recent times, Zimbabwe has managed to preserve its dramatic landscapes and incredible wildlife, and is now very much back on the map and one of the most sought after safari destinations in Africa. In the far north of the country lies Mana Pools, a UNESCO World Heritage protected national park which is undoubtedly one of the world’s wildest and best preserved ecological areas. Mana Pools is famous for its walking safaris which have been conducted since the park first opened in 1963. The walking here is wild and beautiful, the wildlife viewing is excellent and the views are some of the most spectacular in Africa. Your adventure begins in secluded Kanga Pan, a remote part of Mana Pools National Park where the diverse terrain, often inaccessible by vehicle, makes it an explorer’s paradise. Here you will explore the area with an expert guide and enjoy ‘armchair safari’ viewing from your camp which looks straight out over a busy dry-season waterhole. The second part of your adventure is certainly more active as you embark on a four-day walking safari wandering from camp to camp along the Zambezi floodplain and learning about life in the bush en route. The park’s sparse vegetation allows for good visibility and relatively relaxed wildlife, and you can expect close encounters with exciting species, both large and small. Hippos, elephants, baboons, kudu, impala, waterbuck and warthogs are regularly spotted; predator species such as lion, leopard and cheetah are rarer but we found painted wolves twice on foot whilst researching this holiday. Birdlife is also prolific. The views of the river, its open floodplain and Rift Valley mountain backdrop are stunning, particularly at sunset. Moving on from Mana you transfer by light aircraft to Lake Kariba on the north eastern border of Matusadona National Park. Your wonderful lodge here is nestled into the Bumi Hills with panoramic views over the immense lake, so large it seems more like an inland sea. Here you will enjoy cultural and lakeside walks, explore the incredible landscape on game drives and take a boat trip out onto the lake for a final magical African sunset. Accommodation on this trip ranges from rustic electricity-free mobile camps, a truly authentic African bush experience, through to a luxury safari lodge complete with infinity pool and spa! You can expect great service and superb guiding throughout – Zimbabwe’s safari guides are thoroughly trained and tested, and arguably the best in Africa. Meal arrangements: All meals and drinks (except premium imported spirits and champagne) are included during your stay. Depart London for flight to Harare. Fly to Mana Pools National Park. Game drive to Kanga Camp. On safari from Kanga Camp, Mana Pools. Morning and afternoon safari activities from Nyamatusi Camp. Fly to Lake Kariba. Transfer to Bumi Hills Safari Lodge. Lakeside and cultural walks, game drives and boating activities. Fly to Harare and onto London. Your holiday will be led by the expert English-speaking guides in each camp as they have the best local knowledge and you will benefit from their individual areas of interest and particular expertise. The guides who will lead your holiday are naturalists with exceptional experience, they know the African bush intimately, and have an amazing knowledge of the African wilderness and its people. Zimbabwe’s guides are probably the best in Africa. 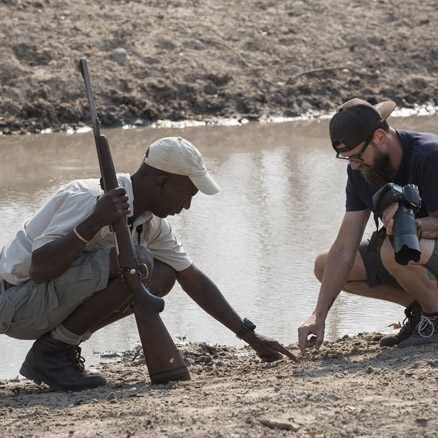 In order to conduct a Walking Safari, guides are first obliged to pass various exams before taking up an apprenticeship under the mentorship of a Professional Guide. This apprenticeship can last several years after which time the Learner Guide takes a final proficiency exam where all aspects of his guiding abilities are carefully tested. All your guides will be armed and have been professionally trained in their use. Depart London on an overnight flight to Harare Airport in Zimbabwe. Day 2 - Arrive Harare. Fly to Mana Pools – 1 hour flight. Safari drive to Kanga Camp. Your international flight arrives into Harare around midday where you will be met and escorted to check in for your mid-afternoon light aircraft flight to Mana Pools National Park. Your guide will be waiting at the airstrip for you on arrival and will drive you to Kanga Camp enjoying your first safari along the way. Kanga is tucked away on a private concession in the most remote part of Mana Pools National Park. This attractive permanent camp has six raised tents and the main area has a comfortable terraced lounge, small plunge pool and dining area. Both individual tents and the central area look out over the waterhole, and there is also a hide beneath the deck. The diverse Kanga area has multiple vlei lines, river systems of the Ruckomechi River, and mixed woodland. Kanga Pan itself is the only known water source in the area available throughout the year, making it a hub for wildlife and a delight to explore on foot. Your first evening will be spent looking out over the waterhole and listening to the sounds of the African bush as you begin to embrace life in this remote location. Day 3 - On safari from Kanga Camp. This morning you will awake to the sounds of Africa, and after a continental breakfast with a choice of fruit, yoghurt, cereals, and toast, you embark on your morning safari activity as discussed with your guide. You may set off by 4x4 to explore the area and look for signs of activity during the night before stopping and tracking fresh spoor of a resident leopard on foot, or perhaps follow a herd of skittish impala. There is no set routine and nature will dictate how things unfold but at least one of today's safari activities will include a walk in the bush. Your morning activity will usually last about three hours and you return to camp before the heat of the day sets in. After a leisurely lunch you will be free to enjoy some armchair wildlife viewing or to relax in the main area, by the pool or take a siesta, often welcome after an early start. Your guide will join you at high tea where plans will be discussed for the afternoon safari which may involve a walk along one of the vlei lines before enjoying a sundowner and returning to camp by vehicle. Dinner is served under the stars with watchful eyes on lookout for nocturnal creatures visiting the waterhole. We saw three leopard quenching their thirst at the Kanga waterhole whilst researching this trip. Day 4 - Shoreline Walking Safari to Vundu Point - approximately 10 km walking, 4-5 hours. Today you are moving on to experience a proper four-day mobile walking safari. After breakfast you will need to have your luggage packed as you will be departing by vehicle for a leisurely game drive to the start of your mobile walking safari on the spectacular Mana Pools floodplain. The highest concentrations of wildlife in Zimbabwe are found in this area and as you walk towards your first mobile safari campsite, Vundu Point, your guide will introduce you to the various animals, birds and plants that make up this unique habitat. When you are walking you will only need to carry your small daypack with essentials such as sunblock, camera, hat, binoculars and plenty of water, and you walk in single file behind your armed guide, the safest formation for bush walking. You will stop in a shady spot en route for a simple bush lunch of cold meats, salads and freshly baked breads before continuing to camp where you will be given a warm welcome. The remainder of the afternoon is free for you to take a shower, relax and settle into mobile camp life. From camp you should also be able to see some of the multitude of animals and birds that are attracted to the water's edge. Hippo, buffalo, elephant and crocodile as well as a variety of antelope species may be seen. As the sun sets you gather around the campfire for sundowners and snacks, discussing the day's events before your guide takes you through the plan for the next day. In the background your support staff and resident cook will prepare a three-course dinner to be enjoyed by candlelight near the campfire. Your accommodation at Vundu is in walk-in style tents supplied with basic en-suite toilet facilities for night-use and raised beds with fresh linen. The tents are mosquito-gauzed with roof vents so you can lie back and enjoy the star-studded night skies. Day 5 - Walking safari to Zambezi Expeditions with bush lunch en route. Approximately 10km walking. 4-5 hours. You will be woken with warm water brought to your tent for washing as the sky flushes pink over the Zambezi escarpment opposite. Breakfast is eaten around the fire; cereal, a hot dish of bacon, eggs or porridge and plenty of tea and coffee sets you up for the day ahead. After filling water bottles you form a walking line formation behind your guide and set off along the shoreline. The riverside scenery on this day is especially beautiful, but sometimes you will walk in land, following spore or exploring different terrain. The shoreline is home to a wealth of wildlife and depending on the time of year you can hope to see elephants a plenty, kudu, hippopotamus, springbok, mongoose, zebra, crested hoopoes, majestic bataleur, African fish eagles, lots of pretty Cape glossy starlings, lilac breasted rollers, carmine bee eaters, European bee eaters, various woodpeckers and Pied kingfishers. Your guide will be careful to avoid elephant breeding herds as they can be unpredictable, and will give any grumpy lone buffalo a very wide berth! You are less likely to encounter predator species on foot but lion, leopard and painted wolves (wild dog) are all found on these floodplains. An early safari lunch will be waiting for you in a shady spot en route, with the chance rest for a while and refill water bottles before continuing to your next camp, Zambezi Expeditions. Zambezi Expeditions is a semi-permanent mobile camp with larger en-suite tents that remain in location for the duration of the dry season. The camp has an open sided dinning tent with lounge area and large campfire, both with wonderful views across the river, and is one of the most welcoming camps in Zimbabwe. Day 6 - Walking safari to Chessa Camp with bush lunch en route. Approximately 10km walking. 4-5 hours. An early start today. Sunrise is one of the most magical times of the day on safari and you stir to the sounds of the African bush waking to a new day. A buffet breakfast table is set up by the campfire at Zambezi Expeditions with staff ready to serve breakfast and hot drinks. This morning you will head out on a game drive along the floodplain, possibly visiting one or two of Mana's famous pools. Game viewing from a vehicle is very different experience; often you can get much closer to animals than you can on foot, and it offers an interesting contrast to the walking. Painted wolves can sometime be found in this area, and whilst researching this holiday we encountered them twice on foot, an incredible experience. You return to Zambezi Expeditions for a delicious lunch, and when the mid-day heat starts to cool you continue the walking safari towards Chessa, your mobile camp for tonight. Your guide will have a wealth of knowledge to share about life in the bush and there is always lots to see whilst walking; fascinating strange insects and spiders, a variety of animal spoors, and plants which are used for a host of traditional medicine purposes. You may even find yourselves engrossed in tracking down a particular species. Your camp from Vundu Point has been moved and is now waiting for you at Chessa, a beautiful spot looking out across the river to Zambia on the far side. Elephants and hippo can often be seen making their way down to the waters edge here. Take your pick from a sundowner or a hot shower as you arrive hot and thirsty into camp, and then gather around the campfire to watch the sun set and share tales from the day. Day 7 - Walking safari to Nyamatusi Camp – approximately 10km, 4-5 hours. Just as the dawn breaks hot water will be placed in raised basins outside your tent, while tea, coffee, muffins or homemade biscuits are already waiting by the campfire. After breakfast you continue east along the floodplain and sometimes into the edge of the surrounding woodlands on the final stage of your four-day walking safari. You walk for a few hours until, as the heat of the day rises, you stop in a shaded spot to enjoy a bush lunch and rest whilst listening to the sound of the birds and marvelling at the beauty and tranquillity of Mana Pools. After lunch you continue on foot to Nyamatusi, a first class camp in a remote location on the banks of the Zambezi River. The wonderful well-spaced tented suites here each have their own plunge pool and uninterrupted views of the river and escarpment beyond. There is an abundance of game and birdlife all around the camp. This evening you will gather in the elegant dining area for sundowners to celebrate your walking safari adventure. Day 8 - On safari from Nyamatusi Camp. This morning after breakfast you will set out on foot to explore the open terrain around Nyamatusi. As the heat of the day rises, you will return to camp for a leisurely lunch and free time to take a dip, relax or sit back and enjoy the stunning scenery. It is likely that you will see a number of animals making their way past camp down to the water's edge to quench their thirst whilst discordant hippos declare the area their own. Your guide will discuss the safari activities available to you this afternoon which may include a game drive, a leisurely canoe safari, bird watching or fishing, depending on group preference and availability. Sundowners and a final sunset over the escarpment bring your time at Mana Pools to a close. Day 9 - Depart Nyamatusi Camp. Fly to Lake Kariba - 1hour 20 minutes. Transfer to Bumi Hills Safari Lodge. Afternoon safari activity. This morning bags need to be packed and ready to go before breakfast as you will be leaving Mana Pools on an early morning fight. You will be transferred to the local airstrip for the light aircraft flight to a remote location on Lake Kariba. The views over the Zambezi river basin and Kariba Gorge on this flight are impressive; from the air the 128m tall Kariba Dam looks infeasibly small to be holding back such a huge volume of water. On arrival into the airstrip at Bumi Hills you will be met by vehicle and transferred to the lodge, a short drive up into the hills. From its elevated position Bumi Hills Safari Lodge has breath-taking panoramic views over the great inland sea of Lake Kariba. Lakeview rooms are nested in the mountains overlooking the endless blue waters of the lake and the game-rich shoreline below. Later this afternoon you may either head down to Lake Kariba for a scenic lakeside walking safari or perhaps go on a walking adventure deeper into the bush to search for fossilized dinosaur footprints. You return to the lodge for dinner. The uninterrupted view from the bar and dining deck is superb, as are the brilliant pink-to-red-to-golden sunsets that Lake Kariba is famous for. Day 10 - Lake Kariba safari activities. Today you can choose your own morning and afternoon activities (arranged with your guide the night before), maybe a game drive in search of the local wildlife, a safari in nearby Matusadona National Park, a cultural walk including a visit to a local village or perhaps try your hand at a spot of catch-and-release tiger fishing. The charm of Bumi Hills Safari Lodge lies in the relaxed atmosphere of the place. For those intent on relaxation, the infinity pool or deck are ideal places to soak up the scenic vistas while spa treatments (at additional cost) can also be arranged. Day 11 - Safari activity and sunset cruise, Lake Kariba. A second full day at Bumi Hills Safari Lodge to relax and explore the stunning Lake Kariba scenery. Lake Kariba is the largest artificial lake in the world, created between 1958 and 1963 to supply Zambia and Zimbabwe with hydro-electric power. Despite being man-made, Lake Kariba is hauntingly beautiful and has a wildlife rich shoreline. Again you can select your preferred morning activity, subject to availability, but this afternoon your group will probably head out onto the lake together for a farewell sunset cruise. Game viewing from a boat affords spectacular photographic opportunities and this is a wonderful way to spend your final evening in Africa. Day 12 - Group transfer to airport and fly to Harare - 1hour. Depart for London. This morning is your last waking up in Zimbabwe. Enjoy an early breakfast on the terrace looking out at the magnificent views and game on the lakeshore below before being transferred to the airstrip for your light aircraft flight to Harare. Here you will be met on arrival and assisted with check-in for your international flight back to London later in the day.